This updates a story posted here last year about the signing the route here. Great work by Mike Kaelin and the California LH supporters! Mike Hocker, Executive Director of the Ohio Lincoln Highway Historic Byway, writes, “I drove by Palmantier’s Motel near Minerva yesterday and saw a sign for an auction Aug 11th. I guess there is nothing else we can do.” The beautiful 9-unit motel is within sight of the famous stretch of Baywood Road paved in red bricks (bottom center of photo). 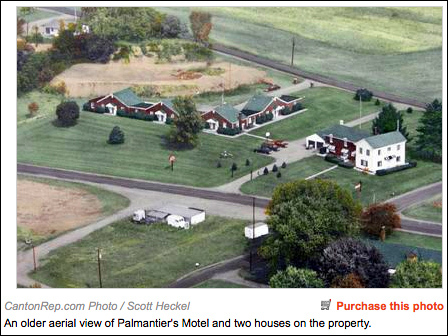 Palmantier’s Motel, opened 1947, was purchased five years ago by Scott Segeti, “lured to these parts by the beauty of nearby farm fields, grazing cattle, grassy meadows, chirping birds, fresh air and an opportunity to be his own boss.” By last year, slow business forced him to put the motel, swimming pool, two houses, and 3.25 acres for sale at $425,000. 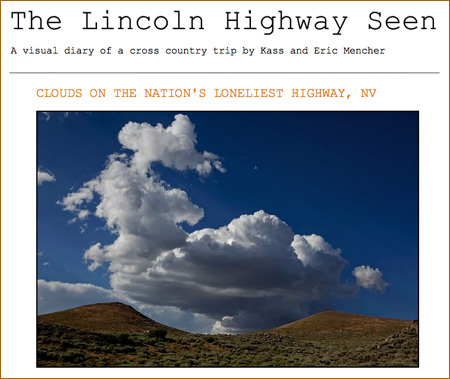 Photographers Eric Mencher and his wife Kass have been photographing the Lincoln Highway since 1997. I reported on their trip last year HERE as they drove Nebraska, Wyoming, Utah and Nevada. Now they’re at it again! Visit lincolnhighwayseen.blogspot.com to see some interesting takes on familiar (and some not-so-familiar) landmarks. 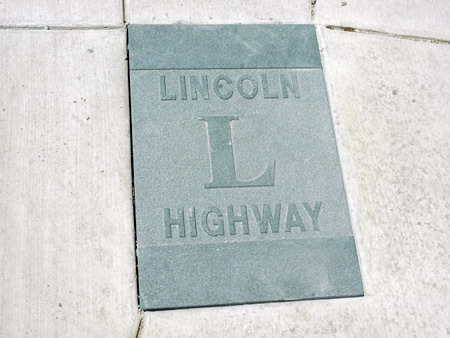 The News-Sentinel of Fort Wayne, Indiana, reports that one of the 15 remaining Lincoln Highway concrete markers in the state has a new home in front of New Haven City Hall, 815 Lincoln Highway E., just a few feet from the road’s original route. That didn’t keep the marker from falling into disrepair and near-oblivion in recent years, however. Believed to have been one of two markers that once stood near what is now the Harrison Street Bridge just north of downtown Fort Wayne, the heavy post was eventually donated to the Lincoln Museum, which never displayed the damaged marker before closing in 2008. The museum gave the more-intact marker it did display to the Indiana State Museum in Indianapolis, but the Lincoln Highway Association was only too happy to accept the post that has been restored by New Haven employees and local stone carver Timothy Doyle, whose expertise allowed city workers to blend old and new concrete seamlessly. 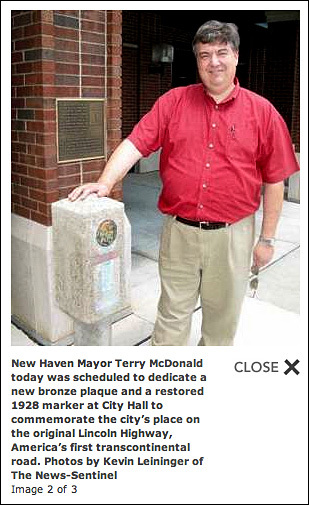 The exhibit includes a bronze plaque donated by the association and the city. 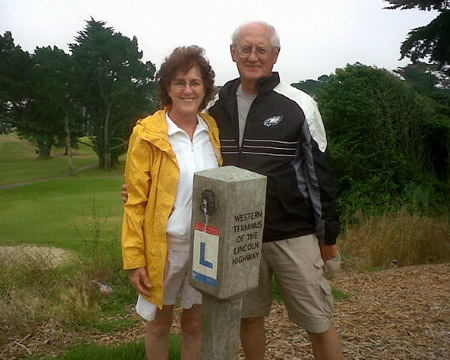 Don’t forget to follow along as John and Joyce Jackson of Delaware, Ohio, follow the Lincoln Highway westward. Actually, they’ve already reached the Pacific and are taking Route 66 back eastward but their adventures are preserved online. Follow along at blog.jacksonlhtour.com/. 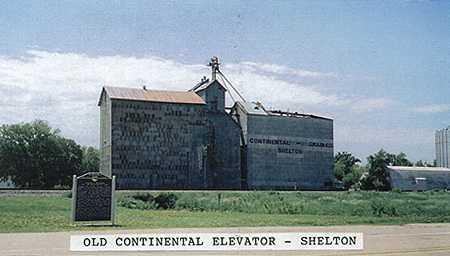 Shelton, Nebraska, will celebrate its 13th-annual Lincoln Highway Festival and car show this Sunday. The Kearney Hub reports that the car show starts at 10 a.m. with trophy presentations from 2:30-3 p.m. The Shelton Historical Society will serve lunch at the American Legion Hall, and the Lincoln Highway Visitor’s Center will be open all day. 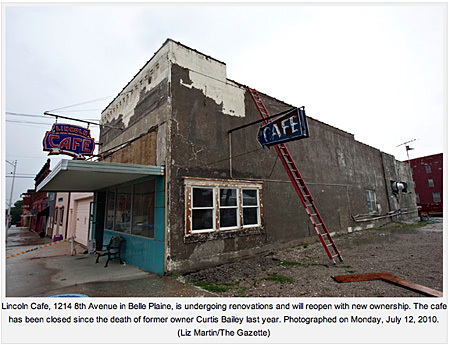 The Grand Island Independent reports that more than 60 cars are expected. Also as a part of the festivities, a kids tractor pull starts at 2 p.m. on C Street and kids can get fire truck rides at the fire station from 11 a.m. to 1 p.m. Contact Bev Thomas at (308) 647-6617 or Bob Stubblefield at (308) 647-6554. To register for the car show, call Cindy Ryan at (308) 390-4123: fee is $10 in advance or $15 the day of the show. 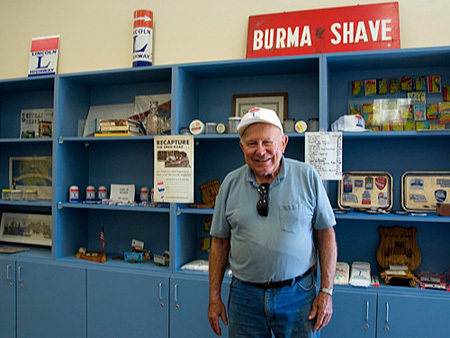 Photo of Bob Stubblefield in Visitors Center by Dave McLane. 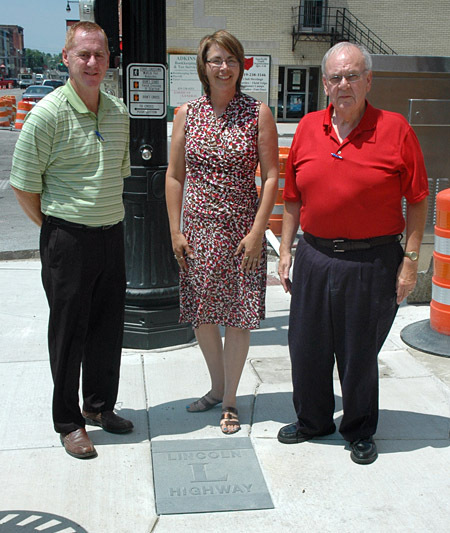 Kirk Dougal, Editor-in-Chief of the Times Bulletin in Van Wert, Ohio, sent photos of one of the 12 Lincoln Highway plaques that were placed at every corner of the downtown Streetscape project. 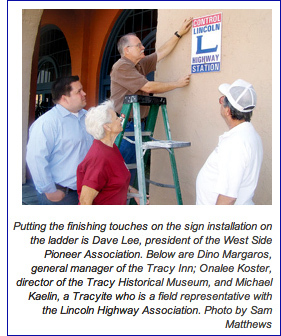 Below, from left: Van Wert Safety-Service Director Jay Fleming; Connie Swander of Swan Memorials, makers of the plaques; and Van Wert Mayor Louis Ehmer. Photos courtesy Van Wert Times Bulletin. The Town of Nevada, Iowa, will celebrate its 27th annual Lincoln Highway Days August 27–29, 2010. The theme this year is “Sharing and Caring on the Lincoln Highway!” but the event always includes standard amusements from carnival rides to rodeo tricks, a parade to baby contest. Learn more at www.lincolnhighwaydays.com/. Last year, motorcyclist Chris Hutter took the Lincoln Highway from Pittsburgh to the east edge of Grand Island, Nebraska. This year he’s hitting the LH in Omaha after a visit to the Surf Ball Room in Clear Lake, Iowa, where Buddy Holly played his last concert. 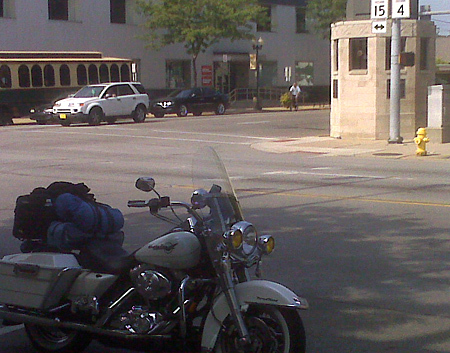 From Nebraska he’ll stay on the Lincoln to its Western Terminus in San Francisco. Follow along at hutmo.blogspot.com/. Note that his map gives a LIVE GPS location! Refresh, zoom in, and see how far he’s gone in a half minute!